The Association of Australian Convention Bureaux (AACB) and IMEX Group are pleased to announce Ms Sue Calwell and Mr Jon Hutchison AM as the AACB Hall of Fame inductees for 2016. 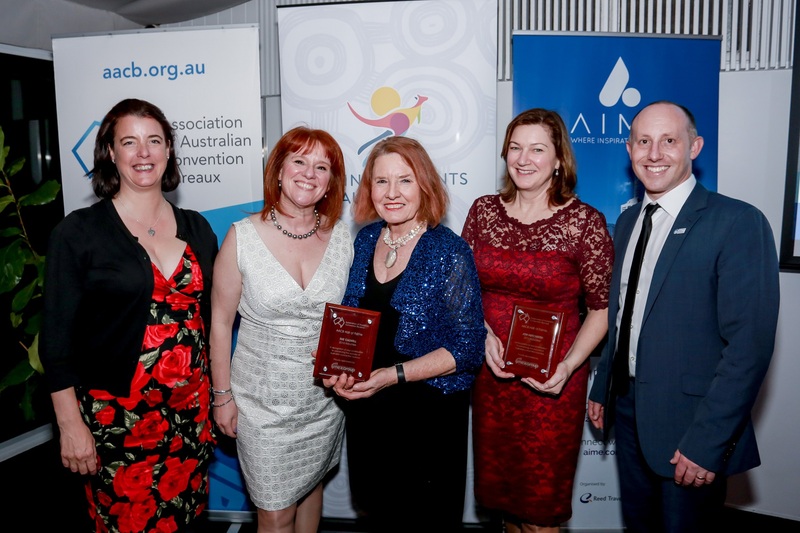 The induction ceremony took place at the AACB’s Annual Conference gala dinner held at Victoria Park, Brisbane on 9 September. The AACB Hall of Fame was established in 2015 to acknowledge the AACB’s continued business events leadership, sponsored by the IMEX Group. The award recognises individuals who have made a significant contribution to the advancement of Australian convention bureaux and the business events industry. It also provides a historical narrative of leaders which have grown and nurtured the industry to present day. In 1976, at age 29, Ms Calwell was appointed Executive Director of the Melbourne Convention Bureau, then part of the Melbourne Tourism Authority (MTA), a role she held until 1996. During her time at MTA Sue led many effective lobbying campaigns to have the Victorian Government understand the potential of, and build a prominent meetings industry. Her role was pivotal to many positive outcomes for the burgeoning meetings industry including successfully lobbying for the Victorian Government to underwrite the establishment of a purpose built meeting venue, The World Trade Centre, the forerunner to today’s Melbourne Convention and Exhibition Centre. A further highlight of her many great business achievements was bringing the World Rotary Conference of 25,000 delegates to Melbourne in the early 1990’s, Sue was also responsible for the development of Melbourne Meeting Mart in 1983, later to become AIME. Mr Jon Hutchison AM, during his stellar 30-year career, led many of Australia’s foremost tourism and travel organisations including holding the role of Managing Director of the Australian Tourist Commission (now Tourism Australia) and immediately prior to his 2011 retirement was CEO of Business Events Sydney. Jon worked tirelessly to secure Sydney’s position as ICCA’s number one convention city in the world in 1998/99, and a top 5 ranking for a further 3 years; he was instrumental in establishing Sydney as the first Australian city to develop the North Asia market, winning 81 events between 2004 and 2010. He also built the trade show “Sydney on Sale”. Jon championed the idea of the “beyond tourism” benefits of business events and their far reaching impact, and pioneered the phrase “Business Events”. Jon has also held various Chairman and honorary roles with key industry organisations including DMAI, PATA, Team Australia and AACB. In 2007 Jon was awarded the Member of the Order of Australia for his services to tourism and business and remains an Adjunct Professor in the Faculty of Business at University of Technology Sydney. Global Travel Media, AACB Announces 2016 Hall of Fame Inductees, 14 Sept 2016. Hotel Marketing Support, AACB Announces 2016 Hall of Fame Inductees, 13 Sept 2016. IMEX Group (Facebook), AACB Announces 2016 Hall of Fame Inductees, 16 Sept 2016.
Business Events News (BEN), AACB Hall of Fame, 15 Sep 2016. ETB Travel News, AACB Announces 2016 Hall of Fame Inductees, 13 Sept 2016.